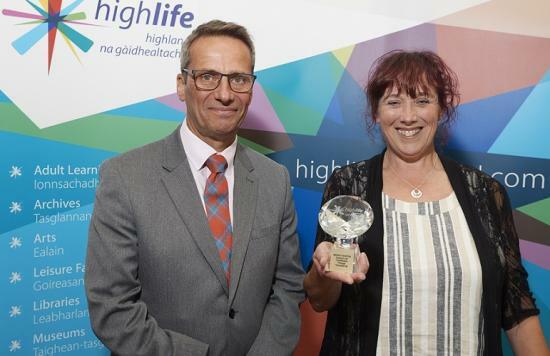 High Life Highland recognised top performing volunteers last Thursday at its annual award ceremony held at Strathpeffer Pavilion. The event saw volunteers from across the Highlands recognised for significant contributions to the charity, its clients and customers. Chair of the Charity board, Donald McLachlan recognised the importance of volunteers to the charity, stating "HLH hugely values the contribution made by its volunteers and is privileged to have over 1700 volunteers, who work tirelessly, week in and week out to assist our staff in delivering a wide range of activities in and around our communities throughout the Highlands. We literally could not deliver the wide range and number of services without their help." Until recently the after school multi sports club at Helmsdale Primary School was a bit 'hit' or 'miss'. Pupil numbers were low and volunteers difficult to recruit. Then along came super mum – Morag Martin who, working closely with the Active School Co-ordinator Louise Nadin and Head teacher Linda Gill and her team set up a very successful after schools multisports club. Now in its 2nd year the club has 16 regular participants which is amazing for a school with only 50 pupils Morag admits that she is not 'sporty,' but what she is, is absolutely passionate about local children being able to have the chance to get involved and enjoy a range of different sports with their friends. People who know her describe Morag as being modest, self-deprecating, determined and reliable with a generosity of spirit and kindness. Erin is one of this year's young ambassadors for Wick High School and she's really made the role her own. Erin was already helping to coach rugby for primary aged children through Caithness RFC and had already gained her level 1&2 coaching certificates before becoming a young ambassador but she now also delivers rugby coaching for the S1-3 boys once a week after school. Until 5 years ago shinty hadn't been played in Mallaig for around 20 years but when John Gillies moved there he changed that and working alongside the local Active School Co-ordinator it is now a thriving sport thanks to the work he has put in to developing and training new young players. John has a real passion for shinty and leads weekly training sessions for primary schools pupils with, at last count, 36 young participants enabling them to not only learn and play the sport but also encouraging them to then mentor those coming up behind. Grace and Annice are volunteer tutors who were originally assigned to work with a Syrian family who resettled in Alness. Both ladies are ex primary school teachers who are good friends and took the initiative to set up English classes at Milnafua Hall for an individual family they were working with. Over time, they realised that other families would also benefit from extra support so they opened up the classes to a further 8 families in the area. Since 2015, Aileen has been delivering a Sunday running club for children as part of the Active Schools programme within Alness. Despite a 9am start on Sunday mornings, Aileen has managed to encourage youngsters aged between 8 and 16 to get out of their beds, forego the bacon sarnies and get their trainers on using the club to not only become active, but to enhance their training for other sports and to socialise with others. Steve Barron chief Executive of Highland Council presenting Morag Martin from Helmdale with her award.